Gary Valenciano in concert at the SENTRUM. Back in the mid-nineties, for DLSL to undertake an ambitious campus development project under then-President Brother Rafael Donato, it had to undertake a hundred million and a half bank loan as funding. It was a long-term loan that the school would be paying until the end of the first decade of the millennium, and well worth taking as everyone in the present day can see. Unlike in the present, however, back then the school just had enough to get by. Building elegant edifices was not the only thing in Brother Rafael’s mind. He was also very much into raising funds for another of his major concerns – scholarships. Despite his stature, it was not beyond him to actually beg: from his own circle of friends, from alumni and alumnae or from companies. There were those who jokingly if unflatteringly referred to him as “Brother Rafael Donation.” He took it all in good humor because he was steadfast in his belief that he was doing it for a good cause. But aside from begging, he also sought other ways to raise funds. 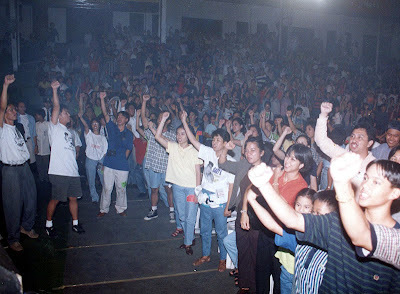 In fact, during his Presidency, the school staged three Gary Valenciano concerts at the SENTRUM within the space of four or five years in aid of the Scholarship Fund. Brother Rafael used to be good friends with Valenciano, who used to be among his students at La Salle Greenhills, and his wife Angeli. Part of the proceeds from these concerts went to a fund named after Valenciano himself. These concerts were all promoted by the office of which I was Director: External Affairs. The first one we sold out in no time at all. The second we had a wee bit more difficulty selling and the third was an abject failure during which there were gaping spaces up in the bleachers. Promoting a concert is back-breaking work; and since the net proceeds from the last was so little, I for one felt that we wasted our time. 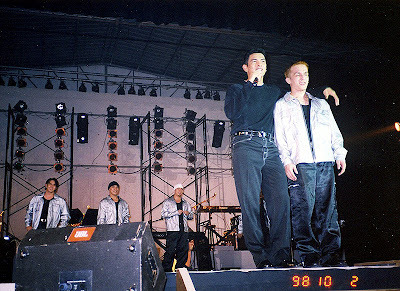 I did try voicing out that a third Gary Valenciano concert in so short a time did not sound like good business at all. But Brother Rafael was very much his own man; and, in the first place, it was very much a case of fait accompli because he had already concluded a deal with Valenciano. At any rate, this article is about a bizarre incident that occurred during the second concert. While the front act was still onstage, the concert director – from Valenciano’s party – suddenly had an inspiration. My staff at External Services and I were very thorough in our preparations for each of the three concerts. We sat down with Valenciano’s party in the morning each time to know what they needed us to do; and we took great pains to ensure that we did our part to a tee. However, during the second concert, the director suddenly decided that she wanted Valenciano to surreptitiously make an entrance via the side gate facing the football field or right next to where my office was at the time. This was not among the things we talked about in the morning, but because she was the director, I really had no choice but to comply. Valenciano was to enter wearing a hood and surrounded by a cordon of people. From the side gate, it was hoped that he would go unnoticed and ascend the stage to a rousing welcome from the concert-goers. The concert director decided Gary V would walk through the crowd for his entrance. I quickly asked for volunteers from my staff, which to be honest was not very hard to do. In every concert, it was standard procedure to have policemen present to help in crowd control. I do not know recall now how two or three of the policemen present during the second concert came to be part of the human shield around Valenciano, but they certainly did. They were probably stationed by the side gate and the concert director must have asked them to join. When I come to think about it now, it sure as hell seemed a cockamamie plan! It did not take long for somebody to recognize Valenciano despite the hood and the pushing and shoving began good-naturedly. Nothing much to be concerned about, though; and Valenciano was able to ascend the stage as planned. It was not until my Secretary Carlo Manglicmot, who was part of the cordon, returned to the office that we started to realize that something had gone badly about the plan. There was an angry red blotch on the front of his denims about the middle of his thigh. It was obviously blood but he did not know how it came to be there because he initially did not feel a thing. He went off to a corner of the office to strip his pants down and look at his thigh; and that was when he realized that he had been grazed by a bullet. It did not take much to put two and two together because there were cops in the cordon, after all. But our immediate concern was that one of the concertgoers had been shot; and if this was the case, there would be hell to pay. All of us quickly rushed inside to see who it was, but there was nothing extraordinary and everyone was having a great time while Valenciano sang and danced onstage. Before long, we learned that one of the cops had been rushed to the hospital because he had been accidentally shot in the foot by his own gun. This likely occurred when people quickly realized Valenciano was walking amongst them and rushed forward. The gun must have gone off during the pushing and shoving. My own people’s conclusion was that the policeman was probably himself to blame because the safety pin must have been off. In the end, it did not really matter whose fault it was because he got injured trying to help out. Brother Rafael, ever gracious, made sure the school helped out with the hospital bill. As for me and my staff, and not that we wished the policeman any harm, we were just glad none of the concertgoers got shot instead. That would have been an altogether different story.